Emphysema is a chronic obstructive disease of the lungs. The lungs contain millions of tiny air sacs called alveoli. In emphysema, the sacs lose their elasticity and air becomes trapped in the sacs. It becomes difficult to expel oxygen-depleted air from the lungs. So the normal exchange of new and used air is diminished. 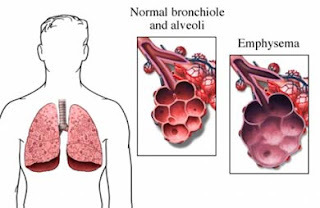 Emphysema is classified as a chronic obstructive pulmonary disease (COPD). There is no treatment to cure emphysema. Treatment aims to ease symptoms and improve quality of life. Quitting smoking slows progression of the disease. Doctors consider it the most important aspect of treatment. Smoking cessation programs may include behavior modification and medications to help you gradually taper off cigarettes. Limiting the number of irritants in the air may help make breathing easier. Avoid smoke, dust, smog, extreme heat or cold, and high altitudes. • Bronchodilators: to relax the airways and open breathing passages. May be given as pills or inhaled. Oxygen is given to supplement the air taken in by the body. It can increase energy levels and heart and brain function by increasing the amount of available oxygen. Because emphysema makes you prone to flu and pneumonia, doctors recommend an annual flu shot. Be sure to have a pneumococcal vaccine. Avoid being around people who are sick. If you think you are getting the flu, contact your physician. You may need to take an antiviral medication. Special methods of breathing and breathing exercises with and without an incentive spirometer can help bring more air into the lungs and force trapped air out of the lungs. This is a technique that utilizes special techniques of clapping on the back and chest to help loosen secretions and special positioning to help the lungs drain. • Maintain a normal weight. Excess weight causes the lungs and heart to work harder. • Eat a healthy diet that is low in saturated fat and rich in fruits, vegetables, and whole grain foods. • Eat several small meals during the day. It makes breathing easier. • Avoid gas-producing foods. An overly full stomach pushes up on the diaphragm, which encroaches on the lungs' space, making it harder to breathe. • Drink fluids to keep mucus thin. • Learn relaxation techniques and other methods to manage stress. • Seek emotional support from professionals, family, and friends. Anxiety can increase the rate of respiration, making breathing more strenuous. • Avoid situations which might expose you to contagious respiratory illnesses. • Be sure to get an influenzae vaccine yearly. • Avoid high altitudes and extremes of temperature.